From L to R: Laurie Phillipson, Clinical Manager, EHAAT; Tracy Nevin, The Princess Alexandra Hospital; and Carol Weller, EVBS. 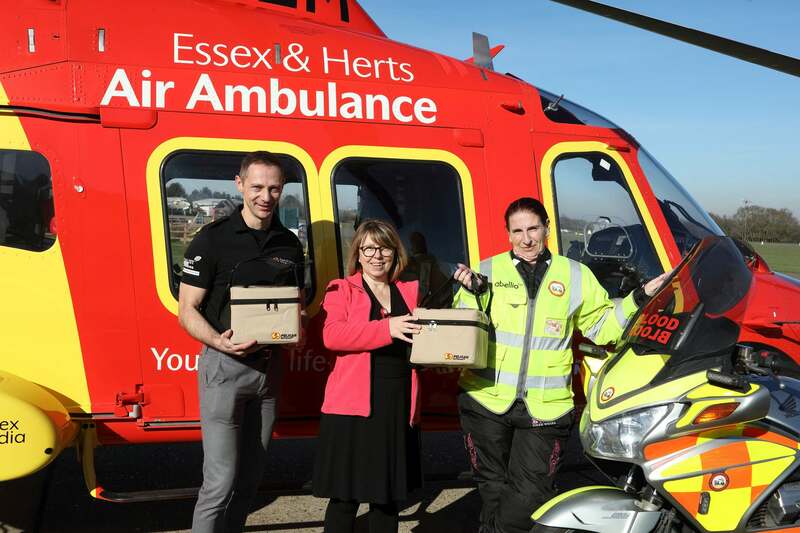 In a major development that provides a significant improvement in the care that can be provided to patients in the region, Essex & Herts Air Ambulance (EHAAT) now carries blood supplies on board its helicopters and Rapid Response Vehicles (RRVs). Being able to give a pre-hospital transfusion at the scene of an incident could be a life-saving intervention for patients suffering significant bleeding and blood loss. This early transfusion will significantly reduce the time lost in having to take a patient to a hospital to receive blood. Patients who have suffered blood loss were previously given a saline solution, which doesn’t carry oxygen or help with clotting of injuries. The EHAAT helicopters and RRVs will carry packed red blood cells of blood group O Negative, meaning they can be used on any patient. When required, these will be given with plasma, the other major component of human blood. Together these can form an effective replacement for patients who have lost blood. 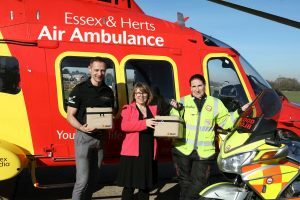 The packed red blood cells will be supplied daily from The Princess Alexandra Hospital in Harlow and be delivered to EHAAT’s airbases at Earls Colne and North Weald by riders from Essex Voluntary Blood Service (EVBS). The blood will be replaced daily and replenished as required. The blood will be delivered and stored in special cool boxes that keep the blood at a cool temperature for at least 24 hours. These are fitted with a data logger that indicates if the temperature has risen beyond safe limits. If unused after 24 hours the blood will be returned to the blood donation system for use elsewhere, preventing any wastage of this precious commodity. When the blood is required, it will be warmed to at least body temperature using a MEQU warmer, which costs approximately £3000, to make it safe to administer to the patient and prevent unnecessary cooling of the patient. EHAAT Clinical Director Stuart Elms said, “This exciting new venture for EHAAT has been many months in preparation and will make a significant difference to the most critically injured patients in our region. We have been working closely with our partners at The Princess Alexandra Hospital and our colleagues from the EVBS to ensure a safe, continuous temperature-controlled supply of these vital products with a wish for zero waste. “Traditionally patients have had blood lost replaced with saline, which has many limitations when what they need is the oxygen-carrying capability and clotting factors of blood products.